"It oozes nostalgia...The author lovingly evokes the world of fruit machines, Haunted Churchyard tableaux and Laughing Sailors." 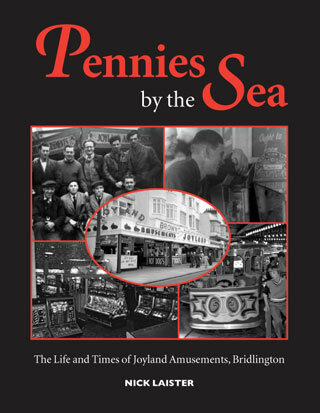 Pennies by the Sea by Nick Laister is the first book on the subject of amusement arcades. It tells the story of what was Britain’s largest arcade – Bridlington’s Joyland Amusements. It is a rags to riches tale of how a glove seller from Sheffield market turned a collection of buildings on Bridlington seafront into a fabulous entertainment complex with slot machines, fairground rides and amazing sideshows. Enter a wonderful world of long days, colourful lights and enormous innovation, an insight into a way of life that once existed at seaside resorts up and down the country but has now largely disappeared.